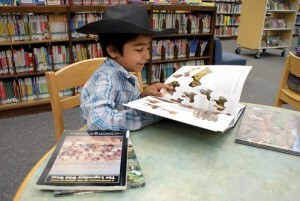 Try to select books about topics your child is interested in. By picking a book about a topic that matches their interest, they will see how fun reading can be. Read books together. You can have your child read to you or take turns switching off reading aloud with them. Get your child their own library card! Become a model reader. Let your child see you reading. In discussion, point out things that you have learned from a book. Create a reading spot in your own home. Pick a place that is away from distractions and provides a comfortable place to get lost in a book. Cook a meal with your child using a children’s cookbook. Creating something from reading provides a fun and different experience. Have a dictionary available in your home. When your child asks what a word means have them look it up.